Manufacturing and product companies are facing critical challenges. To survive in the new global economy, companies need to continuously reinvent themselves. They need to rapidly add new products and acquire new businesses. They need to build new partnerships and channels. They can’t depend on the same set of suppliers tomorrow that they do today. And they can’t expect to do business the same way in new and emerging markets. It’s no surprise that CIOs, manufacturing managers and operational executives are looking for new solutions. They have to find solutions to get the three strategic capabilities they need to succeed: greater operational agility, the ability to collaborate and continuous visibility. You need to position your company to adapt continuously and quickly. 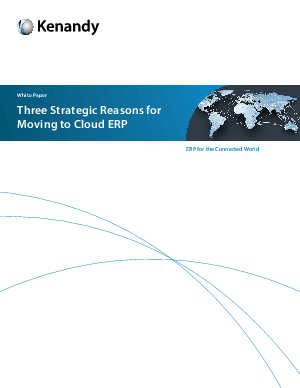 This white paper explains why manufacturing and product companies are primed to move their ERP systems to the cloud. Only cloud ERP can give you the agility, collaboration and visibility you need to reinvent your businesses fast enough in today’s global economy.